Going back to the gym this week after two weeks of vacationing in California has been trying on my body. Yes, Preston and I ran twice and walked a lot while away, but we weren’t in a regular routine, especially a regular workout routine. After running three miles on Monday, I did some weight training for the first time in nearly three weeks. My body was very sore yesterday. I was still a bit sore today, and while I wanted to retreat to the couch this evening I instead forced myself to go to the gym. Tonight I ran a 5K and then did more weight training. 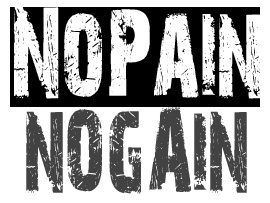 As the old saying goes, “No pain no gain.” I’ve been telling myself this all week as I work towards getting back into my regular routine. Hopefully next week my body will be more adapted back to weight training and it won’t hurt as much to walk or to perform other daily activities. This entry was posted in Motivation, Training and tagged motivation, no pain no gain, positive thinking, training. Bookmark the permalink.